“A Poem Store Open For Business, In The Open Air” * Thank you Debby! No kidding. My hat off to any Poet working towards publication. My hat off to anyone who BUYS poetry. Poets need US to buy their books. Poets need US to shop at locally owned independent booksellers. It is the Independent Booksellers that keep Poets in “business”. Zach Houston, Poet, has taken the matter into his own hands. You just gotta LOVE this! I thank Debby of Living in Graceland for sending this my way! buy a book of Poetry. It will do the world good. Do it for Zach Houston. Zach Houston works at the Ferry Plaza Farmers Market in San Francisco. Houston says he is paid about $2 to $20 for each poem. Houston usually gets from $2 to $20 for a poem, he says. He’s received a $100 bill more than once. 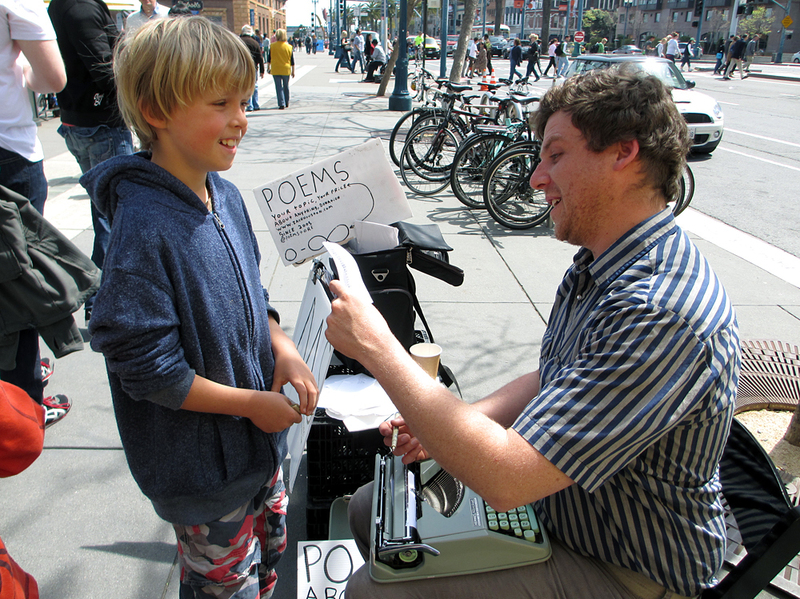 The Oakland, Calif., resident has been composing spontaneous street poems in the San Francisco Bay Area since 2005. Five years ago, it became his main source of income. “I quit my last conventional job on April Fools’ Day, 2007,” says Houston, 29. “They didn’t believe me, because I said I was going to write poems, on the street, with a typewriter — for money.” It was no April Fools’ joke. On most Saturdays, you can find Houston at San Francisco’s Ferry Plaza Farmers Market. Passersby eye his sign and watch intently as Houston types away on his Swiss-made, green 1968 Hermes Rocket. “I’ve always loved poetry. I’ve always cared about how language works,” Houston says. “Believe it or not, it’s not totally a reliable income. Who knew?” he says with a laugh. EnlargeCindy Carpien/NPRZach Houston reads a poem about Legos aloud. The work was commissioned by Miles Fogler, 10. But the career choice has its advantages. Last year, Houston’s work was featured at the Nelson-Atkins Museum of Art in Kansas City, Mo., and at SF Camerawork in San Francisco. “I really like typewriters,” Miles says, “and I wanted to see someone write on a typewriter, because I haven’t seen anybody do that.” And when Miles saw that Houston was writing poems, he decided he wanted one. His topic of choice? Legos (he’s building a big structure at home). Houston is delighted. “Legos are amazing,” he says. “What a wonder. Discrete units, man.” He starts typing. Houston says he’s written thousands of poems in the past seven years on his Hermes Rocket. He gives them away to his patrons. 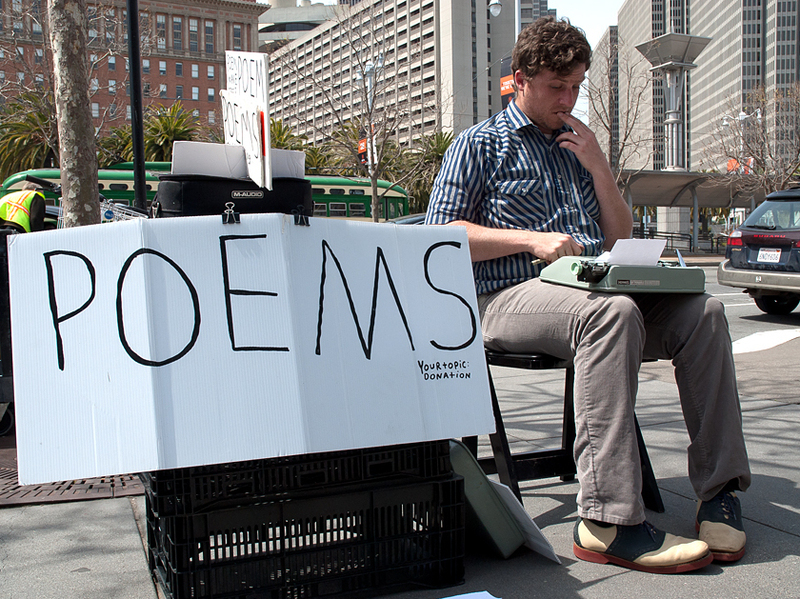 He writes his e-mail address on the poems and asks them to send him copies. Some do. My dear, your enthusiasm is contagious. 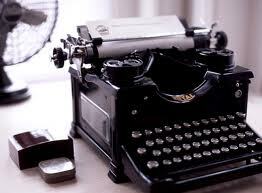 And I LOVE the photo of the old typewriter. Debby, I can not thank you enough for leading us all to this! What a COOL thing to do. Maybe that is what I should do on Poem In Your Pocket Day! I could set up a booth and hand them out (for free of course) on the outdoor mall area. HMMMM?! THAT is a not half bad idea. I LOVE old typewriters and haunt thrift stores The Salvation Army is one of my favorites actually. I relish finding old typewriters. The kids LOVE them too. Many a wild note to many moms has been hatched on our motley assortment of old typewriters…. Thank God for the Salvation Army: for SO many reasons! I know a woman who owns a gazillion old typewriters 😉 and they’re all superb. Right Jen? Hands, and typewriters and words. EXCELLENT awareness post. Poems are so freakin’ great! And i just now started to realize their absolute readability for the “attention deficit crowd”, and i am their leader. XO mel ? I really do need to reign in my Typewriter addiction. They are BIG and Heavy. Hands and Typewriters! YES! I salute YOU the Leader of the Attention Deficit Poetry Lovers Guild! I salute you for 1000000000000 reasons my friend. I do. Where’s the LOVE button? This is you, sharing, caring, writing. I love it. The once English teacher, whose favorite unit was poetry, thanks you. I have to tell you that my favorite teachers were English teachers. I bet that stuns you right? I LOVE that you taught. I wish they still taught Poetry like they used to. They don’t and it worries me. I mean, it really does. Poetry is a way to teach kids so much. It reaches places that prose just can’t as easily. Sigh. POEM IN YOUR POCKET DAY thats what! Oh I wish I had thought of this! How creative, and such a wonderful way to raise awareness that poetry is not dying, but alive and ever changing. Hello there! Thank you very much for stopping by! I agree: Poetry is alive and changing in ways that make sense for our world. I just wish it were more accessible and POPULAR to kids. In someways I think SOME hip hop is carrying on. Poetry will never die. Plein air poetry — who knew?!? This is way cool …………. Isn’t it? It just dawned on me that I could have set up a booth for Poem in Your Pocket Day if I had planned ahead. Wouldn’t that be cool? I could hand out short accessible Poetry for free! I really admire this guy. Too cool! I do have a soft spot for this, as I am addicted to collecting poetry, mainly early contemporary. Every week I trawl through second hand book store etc, and I tend to pine without a purchase for longer than two weeks. Tragic isn’t it? Thank you for stopping by! I too am a Poetry Section Stalker. I have 3 stores I hit regularly. It is an addiction and one I will live with and revel in. One of my favorite things is the moment you open a book in the stacks and look down on a page and CONNECT. I Love that moment. I love those words. Happy Poem in Your Pocket Day. You going to spread some Word Love? This is SO Fabulous, Jen!! Wow, I love and admire this guy (wish I had his guts!)! !